(Nanowerk News) In a recent paper in ACS Nano ("Molecular Sieving Across Centimeter-Scale Single-Layer Nanoporous Graphene Membranes"), a research team from MIT, led by Rohit Karnik, demonstrates selective gas transport using nanoporous graphene membranes at significantly larger scales than previous work. The team's membranes feature ∼1011 permeable pores. Previous studies have measured single or few subnanometer selective pores in microscale areas of defect-free graphene or arrays of relatively large (∼8 nm) pores where the permeance of selective pores is much higher than that through defects. However, large area membranes with sub-nanometer selective pores are much more sensitive to leakage through defects, necessitating scalable defect mitigation strategies, a number of which have been proposed, analyzed, and discussed in this paper. 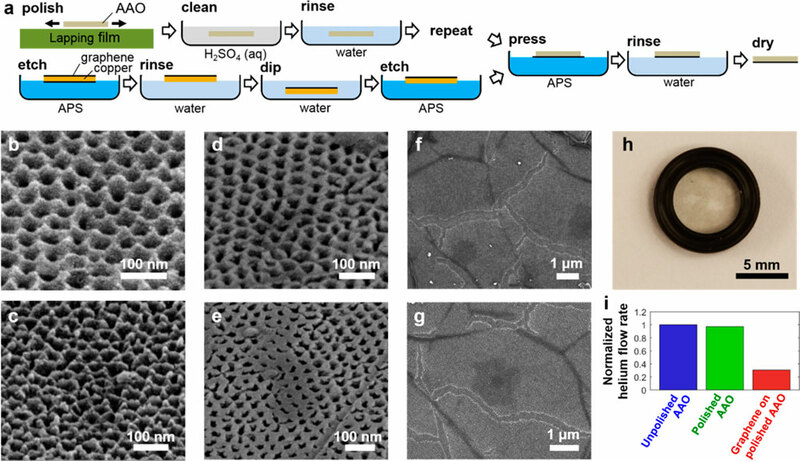 This study focused on two major issues associated with graphene membrane scalability: the design and fabrication of defect-tolerant membranes and methods to produce gas-selective pores in graphene with high density over large areas. Based on multiscale modeling of gas transport, the researchers chose the support membrane structure to isolate small defects and limit leakage through large defects. They showed that ion bombardment followed by oxygen plasma etching produces a high density of pores with sub-nanometer size, suitable for gas separation. This led to measurable molecular-sieving-based selective gas transport through centimeter-scale areas of graphene. The team reports that the extracted graphene gas separation performance for H2/CH4 was competitive with the Robeson limit and that for H2/CO2 exceeded the Robeson limit. "However" they note, "it is important to note that this estimate relates only to nanoporous graphene. The overall membrane has tears and a support with limited porosity, which reduces permeance and selectivity." 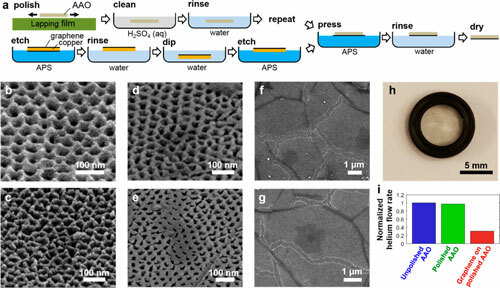 Although gas selectivity was achieved with a large number of pores over relatively large areas, the measured overall membrane selectivity and permeance were lower than have been predicted possible with graphene, highlighting the opportunity for further advancements. Despite predictions of graphene membrane gas selectivities far exceeding those of conventional membranes, even a low level of defects in graphene will limit their use to separations with modest purity requirements. Due to similar considerations, conventional membranes are often not the method of choice for high-purity separations. "Further work is therefore required in pore creation as well as leakage mitigation or defect sealing to improve the selectivity of nanoporous graphene," the team concludes. "Advances in membrane fabrication are required to bring the performance of graphene membranes closer to their potential."